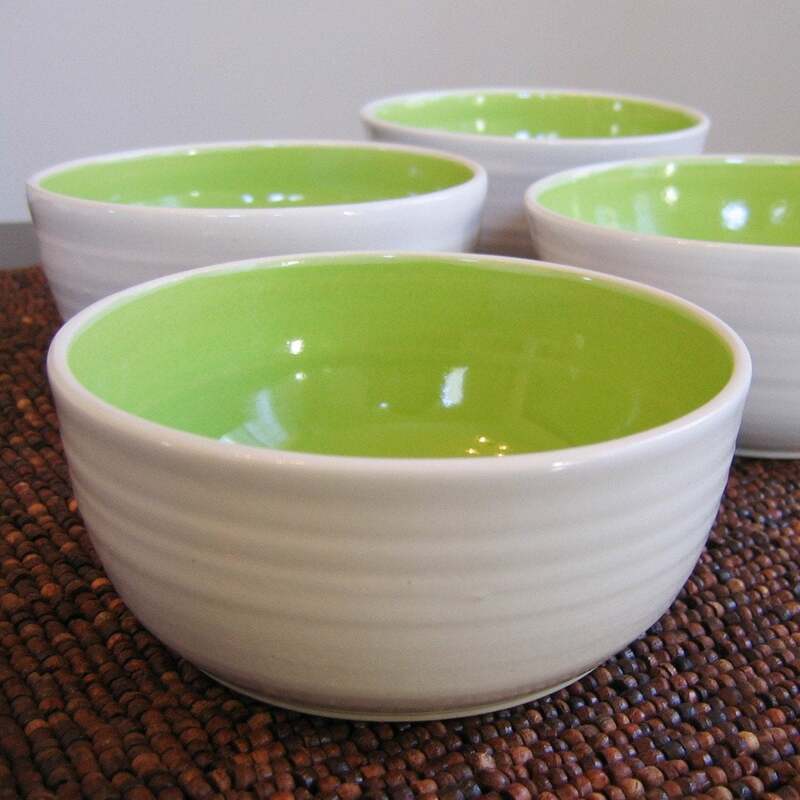 Karin Lorenc makes functional stoneware pottery in bright colors. All of her pottery is food, dishwasher, and microwave safe in addition to being just gorgeous! Read on for more about Karin. I've loved working with clay ever since I took a community art class when I was 7 years old or so. It was on Thursday afternoons and all week long I'd look forward to it, hoping I'd get a chance to throw on the wheel. Now I get to throw pottery everyday! As an adult I took an art class in the rain forest where I learned to make and fire pottery with what I could find outside. There was no going back after that! I love the natural process of making pottery. It's fun to eat out of a bowl or drink from a cup that's really just a hunk of earth. EAT!!! And cook. I LOVE food. And I love to eat food off of pretty dishes. Especially the handmade kind. Taking pictures is a nightmare for me. I have shaky hands. Well actually they only seem to be shaky when I'm taking the pictures... I'm getting better but I still have much room for improvement. I think I might pick this set of mugs. I have trouble making up my mind when choosing colors. When I have my morning coffee I always pick a mug to suit my mood. As a potter I have some pretty great options as you might imagine! First it was a teacher. Then an artist. I'm doing alright in the grand scheme of things. I love the pottery from Object Alcove. And I'm quite addicted to handmade soap. Two Rivers Soap Company is one of my favorite soap stores. Cheese! World travel. World cheese tasting. Aah the best of both worlds. Indeed. Mmm...cheese. Visit Karin Lorenc today. Hey! Maybe you should eat a cheese sandwich off of one of these!